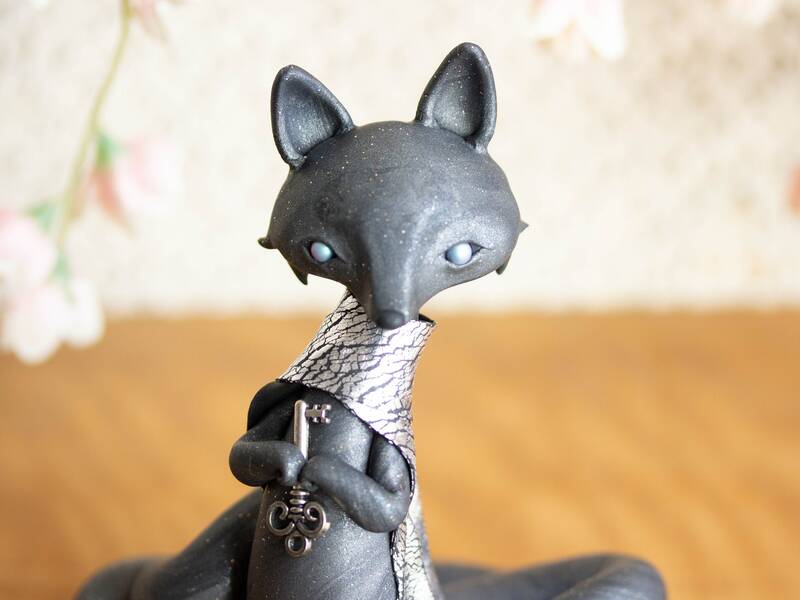 This Shadow Kitsune was inspired by the Kitsune Fox of Japanese folklore. 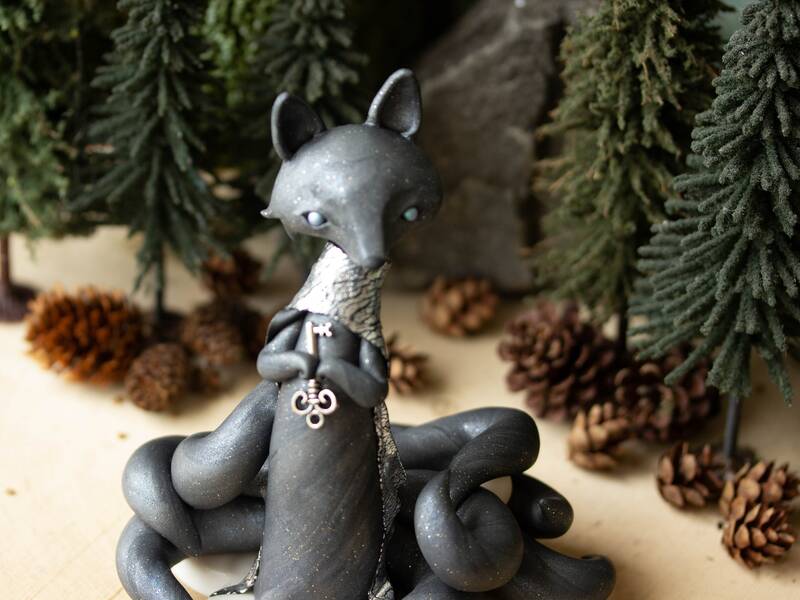 It is said that the more tails a Kitsune has, the more wise and powerful their magic. Indeed, their magical abilities are known to increase with age, along with the number of their tails, and their maximum number of tails, is nine. Their magical traits include the ability to assume a human form and wisdom that knows no bounds. 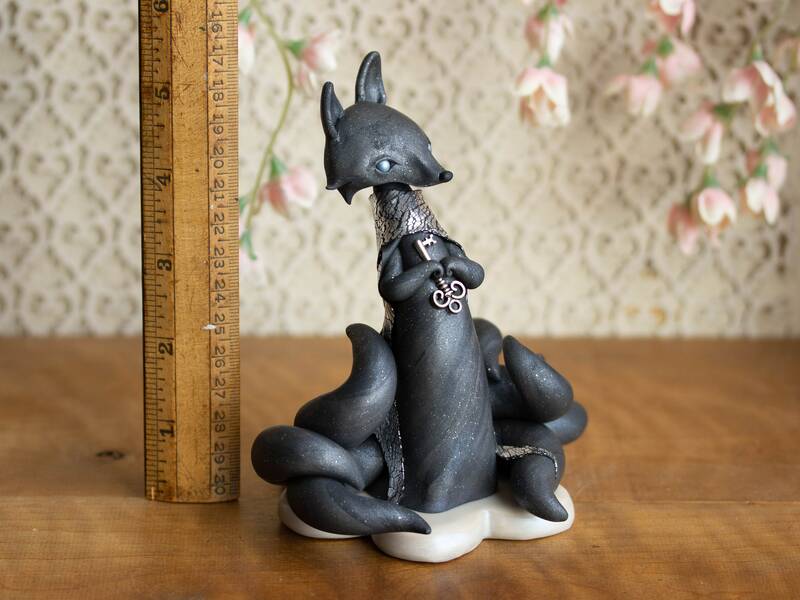 This Shadow Kitsune carries a brass key as she is the guardian spirit of what is most precious and nourishing that resides in the shadowy realms of night dreams and memories. 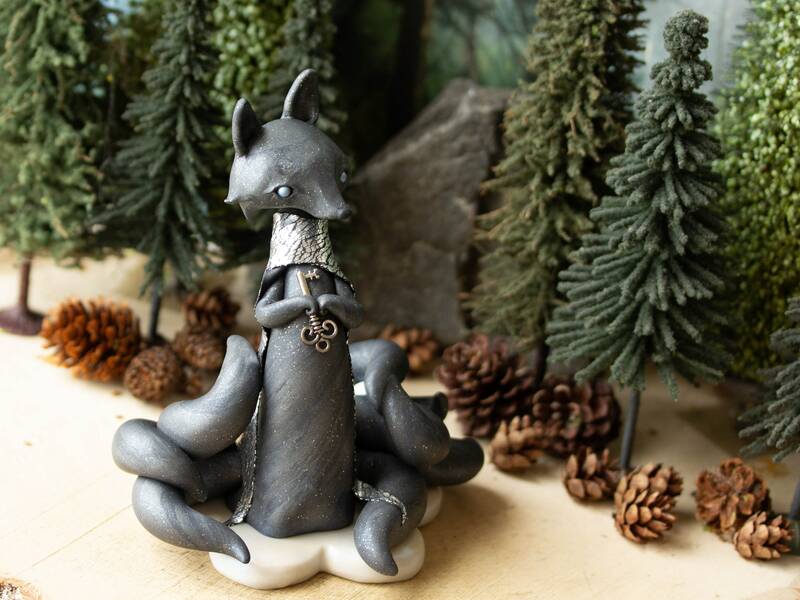 The Shadow Kitsune wears a smokey grey gown that sparkles like the night sky and a shiny siver-leafed cloak. She has tiny paws that curl into magical spirals. Her nine tails form an extravagant train behind her and conceal a pearl of wisdom. 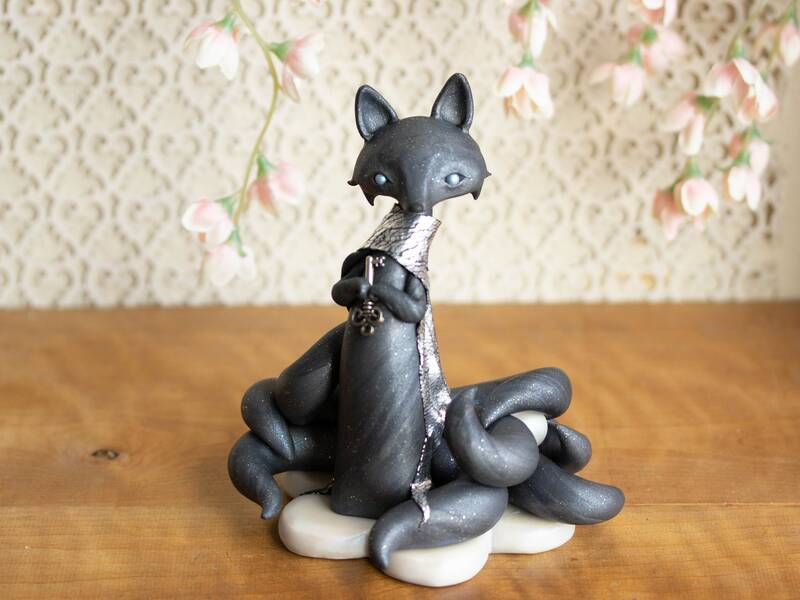 I sculpted her by hand with a pearly white polymer that has a subtle marbling, sparkle and sheen. She stands upon an pearly white sakura blossom with a soft iridescence and stands between 5 and 6-inches tall. Gorgeous piece of art. Beautifully crafted, securely packaged, went right under the Christmas tree since it needed no extra decoration or wrapping. Very appropriate for this time of shadows. Thank you, highly recommend. 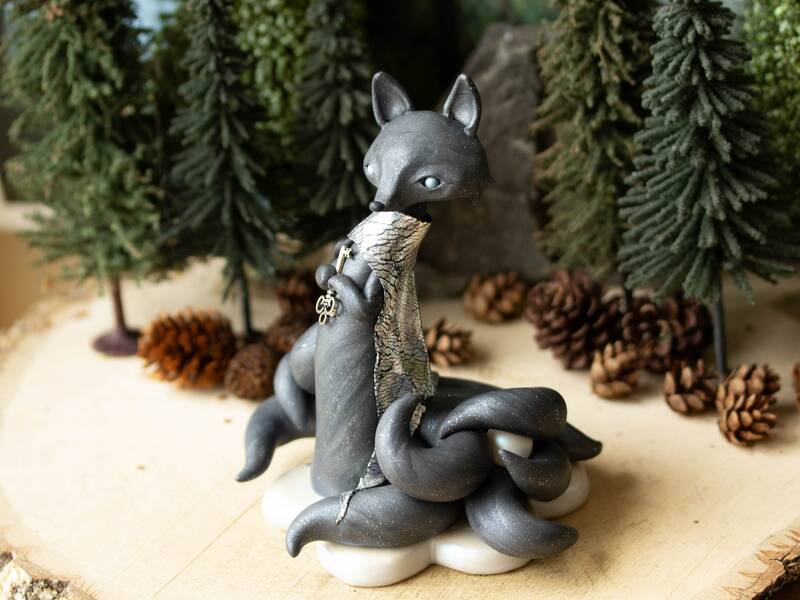 Sofie, I cannot thank you enough for such a wonderful Birthday present :) I couldn’t be more pleased with my Kitsune and Sooty Owl; they make the perfect pair and a great start to my Poupette Menagerie. I can’t wait to order from you again!